In order to avoid extinction, the Communist Party of India (Marxist), whose total toll in the Indian parliament reached its all time low of nine seats in the last general election, has decided to join hands with the Congress Party in certain seats in West Bengal, from where the leftist party was almost wiped out by the All India Trinamool Congress years ago, and in which the Marxist party, as per the popular assumption, cannot win at least one seats if it goes to the polls without the support of the grand old party. 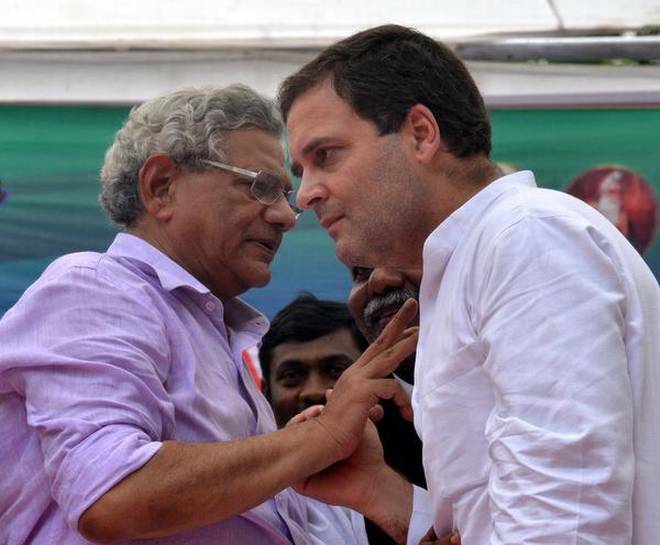 The TMC, which recently proved its strength by launching a, so called, historic protest in the state against the central government (which, as par the TMC’s allegation, tried to unconstitutionally intrude into the state affairs), has not yet responded publically about the proposed CPI (M) – Congress strategic alliance, indicating that the party which rules West Bengal is very confident about its position in the state and is not at all worried about any alliance. A political observer says that the infightings in the opposition camp in the regional levels would adversely impact its prospects in the central level. Don’t you think that it is high time to resolve the infightings in the opposition camps in the regional level?